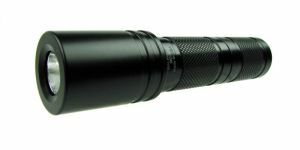 The Malkoff Devices “Wildcat” is a high powered yet relatively compact flashlight characterized by its blazing output and wide beam pattern. Utilizing three Cree XP-G2 emitters, the Wildcat is rated to produce up to 1350 lumens initially (1150 lumens continuously) and also has a low mode which provides 40-50 lumens. 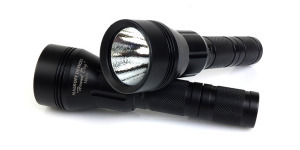 The Wildcat can be used with any of the flashlight bodies and tailcaps from the Malkoff MD series and has an operating range of 6 to 10 volts, allowing for a variety of battery combinations. This review will focus on the Wildcat with the MD3 and MD4 bodies and powered by lithium primary as well as lithium-ion rechargeable batteries. Note: This review is for the 4th generation Malkoff Wildcat which is no longer available. For a review of the current version, be sure to check out the Malkoff Wildcat V5 review. While it was in production, pricing for this version of the Wildcat was $125 for the head only, $180 when equipped with the MD3 body, or $184 with the MD4. 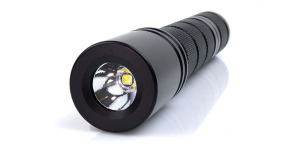 Considering the amount of light it produces, the Malkoff Wildcat is surprisingly compact. Measuring less than 7″ long when fitted onto the MD3 body, the Wildcat is small enough to be easily carried in a pocket or holster and, even with the longer MD4 body, the light is only 8″ long and is still a very manageable size. With a body diameter of 1″, the Wildcat is compatible with many mounting accessories and holsters made for tactical and weapon mounted flashlights. The Wildcat is solidly constructed of 6061 T6 Structural Aircraft Grade Aluminum finished with black Type III anodizing. The interior of the MD3 and MD4 bodies is Chemfilm coated for corrosion protection. The Malkoff Devices brand name and the “Wildcat” designation are proudly displayed on the head. Both the head and body are individually serialized for identification. The three Cree XP-G2 emitters are housed behind an optic which, in turn, is protected by a shatter resistant coated acrylic lens. The head measures 1.8″ at its widest point. At the opposite end of the light, a McClicky forward-clicky style tailcap switch allows momentary operation with a partial press and constant-on operation with a full press and click of the switch. A raised edge around the tailcap allows the light to tail stand on a flat surface and helps reduce the possibility of accidental activation. The rubber boot and the switch itself are user replaceable. Both the head and tailcap are removable and batteries may be loaded from either end. The interior of the battery compartment measures 18.7mm in diameter and will accomodate most lithium-ion rechargeable batteries. O-rings are used at both the head and tail to maintain a weather tight seal. The inclusion of the High/Low Bezel Switch allows users to select between full output with the head fully tightened and low output with the head loosened a fraction of a turn. The brass High/Low Switch is completely housed inside the Wildcat head and utilizes a resistor to produce the lower output level, varying between 40 and 50 lumens depending upon the type of batteries used. Shock isolation for the batteries is provided by springs at both ends. Electronics are fully potted for protection. With an operating voltage range from 6 to 10 volts, the Wildcat can be used with several different battery combinations, depending upon the body used. The MD3 body allows the use of 3 lithium primary 123A cells or 2 lithium-ion 18500 rechargeable batteries. The longer MD4 body permits the use of 2 lithium-ion 18650 batteries. Using four 123A primary cells will provide too much voltage and destroy the electronics. In addition to the MD3 and MD4 configurations, the Wildcat can also be paired with the Malkoff MD2 body and powered by a single 18650 cell with reduced output or 2 x 18350 IMR rechargeable cells for full output. 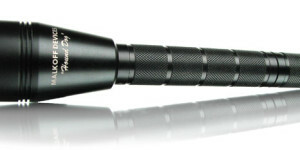 The Malkoff Wildcat produces an initial 1350 lumen beam which is evenly distributed with only a hint of a center hotspot. The beam is white, with very little indication of the blue tint normally associated with cool white emitters and is very clean with no visible artifacts or rings. Although the Wildcat is intended to be more of an area light, its sheer power enables it to produce a beam with up to 17,000 lux intensity and is easily capable of reaching several hundred feet. The wide spill beam can also illuminate details over 200 feet away. The following slides show the Malkoff Wildcat compared to a variety of other lights to give some perspective with regard to output and beam profile. The images can be compared across their full width using the slider and additional comparisons can be viewed by using the navigation buttons in the bottom-right corner of each image. When tested with 18500 and 18650 lithium-ion cells, the Wildcat was able to maintain at least 90% of its initial output for the majority of its runtime. As the cells became depleted, the Wildcat’s body became noticeably warmer providing some indication of the need to change or recharge the batteries. Lithium primary 123A batteries sustained the high output for 14 minutes before dropping to approximately 300 lumens. This was followed by a slow rise in output over the next 75 minutes of operation before beginning another drop as the batteries were depleted. Although the 123A cells cannot sustain the maximum output level for long periods of time, they are still adequate for shorter bursts and provide a long tapering output as they become depleted. 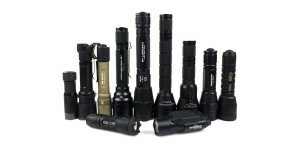 The Wildcat’s modular design is a key advantage as it allows users to exchange parts between the various Malkoff flashlights and configure the light based upon their specific needs. Also, support for 18mm batteries allows the use of more powerful 18500 and 18650 lithium-ion rechargeable cells providing an attractive alternative to using disposable primary batteries. Due to being sized for 18mm batteries, there can be some battery rattle when used with the smaller 123A primary batteries. Movement is minimal and the head and tail springs maintain battery contact even under hard use. 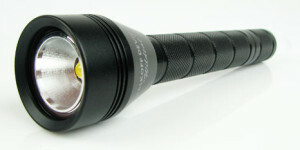 The Malkoff Wildcat, quite frankly, is the type of flashlight that makes a flashaholic smile with its unique combination of price, power, modular design, and beam pattern. Backed by the solid reputation and support of Gene Malkoff there is no doubt it is a quality USA made product designed for years of use. It is definitely one of my favorites. Be sure to share your thoughts, questions, or Malkoff experiences in the comment section below. Additional information about the Malkoff Wildcat can be found on the Malkoff Devices website. Awesome review!!! Please review that hound dog!!! Can’t wait to see that in action before I buy one!!! Malkoff Devices makes amazing products. Thanks for stopping by and also the compliment! The Hound Dog is another great light and I will be posting a review of it (hopefully) soon. I just got my Wildcat V4 a couple of weeks ago before they introduce the V5 Wildcat. I’m gussing no more V4 will be made? I’d like to see a comparison between the two versions. Good work on the review! Thanks for visiting. A review of the V5 has just been posted, including a comparison to the V4! Also looking forward to the Hound Dog review. Is the Hound Dog utilized in the beam shots the neutral or cool white version? The one in the beamshot comparisons is the cool white version. Thanks for visiting and I will get a Hound Dog review up one of these days!